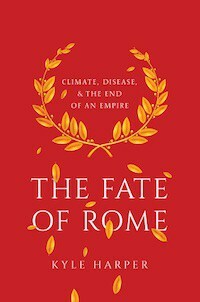 The Fate of Rome: Climate, Disease, and the End of an Empire is an excellent book. I highly recommend it! But one of its assertions, which I accepted at face value at the time I read it, now seems to be less certain (likely wrong). The author contends that the network of trade and interaction facilitated by the emergence of the Pax Romana was instrumental in the rise of periodic pandemics. 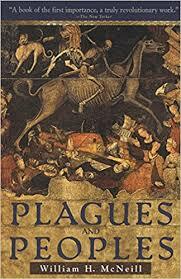 There was the Antonine Plague, the Plague of Cyprian, and the Plague of Justinian. In contrast, Neolithic Europe, and earlier civilizations may have been subject to endemic diseases. But not pandemics. 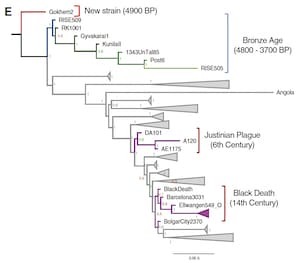 The plot to the right shows that Yersinia pestis in Swedish Neolithic farmers, who are genetically similar to modern Sardinians, is basal to the Yersinia pestis in Bronze Age steppe pastoralists, which is basal to later outbreak strains. The point here is that Yersinia pestis seems to a dynamic part of the broader Eurasian pathogenic landscape. 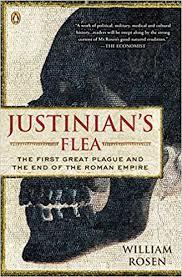 The Plague of Justinian was not something new, but the latest manifestation of a reoccurring phenomena. The conditions for its flourishing existed before the rise of Rome. What was probably different in the case of the Roman Empire was a matter of frequency and rapidity. As the paper, and David of the Eurogenes blog note, there was a massive demographic and social regression in late Neolithic Europe. It is hard to disentangle the variables though because they are all connected. When you read the impact that plague had in the New World on native societies, one of the key elements is that societies on the Malthusian margin often collapse when mortalities go above expectation. Crops go unharvested, and people have to tie up their labor in taking care of the ill. This leads to malnutrition and further susceptibility to the plague. Or, you can imagine a system where a warm and rainy climatic regime increases primary productivity (e.g., medieval climatic optimum), which leads to greater population density and therefore specialization and economic activity and trade. Then, you might be subject to a climatic shift, in which case productivity drops, and famine ensues. This famine results in increased susceptibility to disease, and plague spreads through the preexistent trade networks established during times of plenty. The decline is partially endogenous to the system of human societies. External climatic shocks are going to happen now and then. But there are internal dynamics, such as population density, which are going to impact how resilient a society is to an external shock. It seems likely that the first dense agglomerations of humans were likely going to run up against the limits scale no matter what. Disease serves as a natural Malthusian check, and it was likely inevitable due to the vicissitudes of the circumstances that there would be spikes in mortality so that the population was reduced back to its carrying capacity. This is a general point. Early societies were subject to random shocks, and those shocks knocked them down a peg for quite some time. But eventually social systems became less fragile, and total collapse and cultural amnesia was generally avoided. The socio-economic complexity of the Roman Empire declined precipitously in the 5th century, with the post-Roman world having to slowly wind itself back up during the “High Middle Ages” (in Western Europe at least). But the ideological superstructure of the Roman world, Christianity and such, maintained an intellectual and cultural continuity, so that Roman institutions and forms could be resurrected when social and economic complexity necessitated it (e.g., Roman civil law). The post-Roman Europeans were primitive in many ways compared to Rome, but their society had not be totally obliterated, so they did not have to reinvent the wheel, so to speak. More specifically in this instance, it seems that the arrival of the Eurasian agro-pastoralists in the third millennium BC into Northern Europe was not due to their inadvertent biological weaponry. The diseases they brought. The Neolithic societies descended from those who introduced farming were already in collapse, and likely very vulnerable to the predations of agro-pastoralists. This is almost certainly a common event in prehistory, which we will become much more aware of in the near future due to science. For example, I predict pestilence will be associated with the end of the Uruk Period in the Near East.